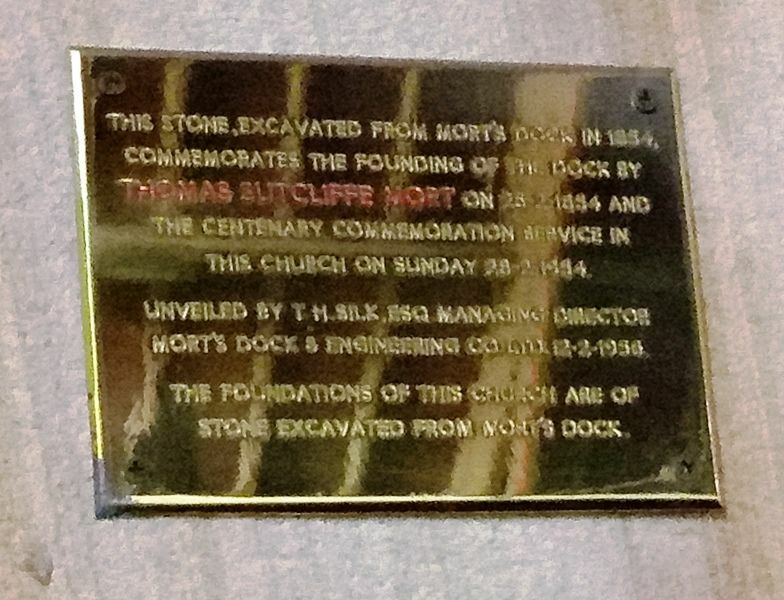 A plaque commemorates the founding of Mort`s Dock by Thomas Sutcliffe Mort in February 1854. This stone, excavated from Mort`s Dock in 1854, commemorating the founding of the dock by Thomas Sutcliffe Mort on 25 - 2 - 1854 and the centenary commemoration service in this church on Sunday 28 - 2 - 1954. Unveiled by T M Silk, Esq Managing Director Mort`s Dock & Engineering Co Ltd. 12 - 2 - 1956.